Is a file system just the layout of folders? I have used Windows since childhood, and when I hear the phrase "Windows filesystem" I think of directories (folders) within directories, a folder called SYSTEM, a folder called PROGRAM FILES etc. Is this what the system is? Just the layout of the folders? And then I recently started using Linux, and my reference book says in the linux filesystem everything starts at root and branches off from there. How is that really different from Windows? I mean, it seems the linux system and the windows system are just two ways of setting up a directory tree. Is this what file system means? Just the layout of the folders? Let's take the FAT32 file system as an example. I can install Windows XP on it, but I can also use it on a memory card. On a memory card, you don't have those folders that you sum up. So... Don't confuse the directory layout of a family of operating systems with a file system. Is this what a file system means? No... It refers to the underlying bits and bytes that make your directory structure work. The underlying bits and bytes? Show me FAT32! Two File Allocation Tables, allowing us to figure out where our files are. Clusters containing all our directory and file data. Some very small unused space that we can't use. A FAT table consists of a lot of entries that look like this, allowing us to determine where the directory or file is stored in the clusters space, as well as some attributes and size. Do other file systems differ? Show me NTFS! I'm going to show you an image so you can notice the differences, the rest is homework for the reader: More information can be found on this blog archive or Google. What about the file systems on Linux? Show me ext2/3! The big difference between Linux and Windows, at least when it comes to their filesystems and directory trees is that in Linux "everything is a file", and everything descends from a single root. This also applies to almost all Unix-derived OSes such as BSD, OS X, Solaris, etc., but I'm going to just say "Linux" to be generic (if not entirely accurate). Windows allows for multiple named roots for their filesystems. You understand these as drive letters: C: D: E: and so on. Each one has a root (\), and a tree that descends from it. Recent versions of Windows allow for things like volume mountpoints, where a volume (what you'd consider a partition) can be mounted to an existing, empty folder. So instead of D:\ representing the root of, say, your optical (CD/DVD/BR) drive, you could mount it at C:\Optical instead. This is more similar to what Linux does. There's also an underlying, single-rooted, object namespace for everything in Windows similar to what Linux uses and is managed by the Object Manager, but most users rarely see it referenced since it's primarily for kernel use. Linux has a single root: /. Everything descends from it, and it doesn't necessarily need to represent your hard drive. Hard Drives, Optical Drives, Memory Cards, Network Shares, Printers, Scanners, CPUs, RAM, Processes, ... everything is represented somewhere inside this single namespace, and can be access by any process with standard file management APIs, presuming you have a high enough level of access. Just because you can read or write from it doesn't mean it's a file on your hard drive in Linux. For example, devices are typically mounted into /dev, so accessing things in there often means you're talking to a device -- maybe it's the sound card, or a scanner, or a camera, etc. These are known as device files. Procfs is a special "filesystem" that's normally mounted to /proc and has a "directory" for every running process, with files in each directory relating to things like the command line used to invoke that process, memory maps, open files, etc. Sysfs is another special filesystem (mounted on /sys) used to expose a wealth of information about the running kernel objects and can also be used to fine-tune the running kernel by simply writing to a particular file. The filesystem is not only about how a directory tree is set up, but also how this information is encoded on the media, too. 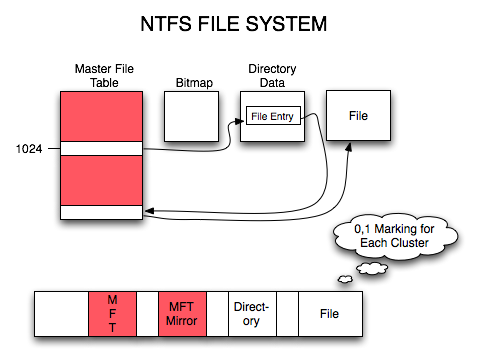 There are several filesystems for Linux: ext3, xfs, raiserfs, etc. You can think of file systems as different formats for storing files and folders, somewhat analogous to how MS Word and PDF are different formats for storing documents, or MP3 and WAV are different formats for storing audio. Given a few files and folders, the file system is the format and the code that stores them to disk so they can be read back again. And just like not all video players can play all video formats, not all operating systems can read all file systems. E.g. if you store a file from Linux on an ext3-formatted USB stick, Windows cannot read the file since it doesn't know how to handle the ext3 file system. See Wikipedia for a comparison of file systems. Not the answer you're looking for? Browse other questions tagged windows linux filesystems or ask your own question. Is file system part of operating system? Can hard disks read and write simultaneously on different tracks? How? What does “mounting a root file system” mean exactly? Why does the root directory '/' have a reference to its “parent”? Are the size of a memory page and the size of a file system cluster always the same? What exactly is a Linux filesystem? What directories consume space in a given file system?